Just an absolutely stunning photograph! You know I cannot pass up an opportunity to comment on a beautiful mountain scene. I had not seen this shot at 7600m. It is absolutely striking. It also shows the steepness of C-2 very well. You would not want to go sleep walking here! You took this two days ago? Meaning you were just up there, wow I\'m suddenly jealous. 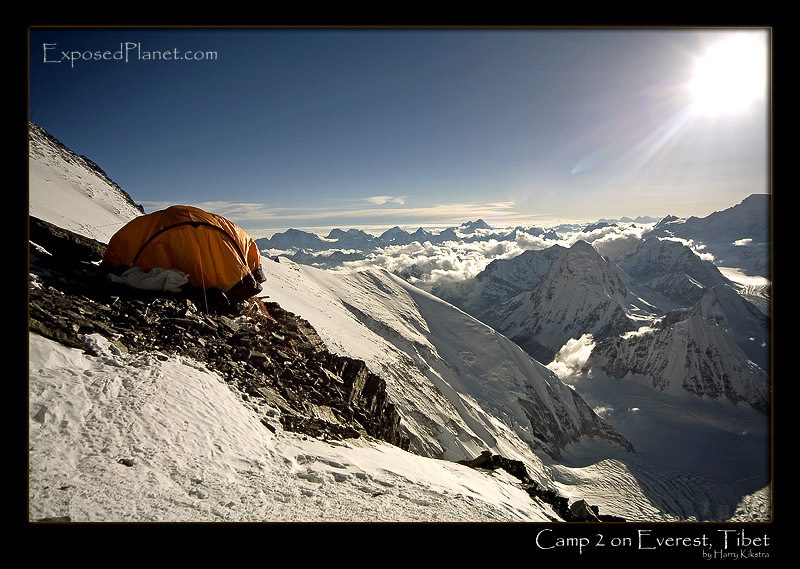 The story behind "Camp 2 at 7600 meter on Everest, Tibet"
This is to congratulate everybody who climbed Everest this year, whether to the summit or not, as long as they came down again. Just before the sum set over Cho Oyu, on the border of Tibet & Nepal. This is to congratulate everybody who climbed Everest this year, whether to the summit or not, as long as they came down again.Just before the sum set over Cho Oyu, on the border of Tibet & Nepal.